A slight case of forgetfulness proved to be incredibly rewarding for a Melbourne man, after his two lottery tickets won the Division One grand prize twice. The incredible story began after the St Albans resident bought two tickets separately at two different outlets in Melbourne for the Oz Lotto Tuesday draw last week. He had forgotten that he bought the first one, and landed up with two tickets on the same draw. Thankfully, the man used the same numbers on both tickets that he has been playing for 30 years straight. This is what resulted in him bagging over $46 million when the two entries each won the Division One prize in the Oz Lotto draw. After being told about his win by lottery officials, the man said: "I'm speechless. I can’t believe it." The winner, who has chosen to remain anonymous, said that he played every week. "I have always marked my entries, but I have never chosen the numbers on anything in particular,"" he said. "They weren't special before, but they are now." The lucky man said that he would share his winnings with family but hadn't really thought about how he would spend his prize otherwise. "I might think about retiring. First maybe a new home or a holiday," he mused. According to a spokeswoman for Oz Lotto, the man was completely oblivious to the fact that had won the massive prize - never mind twice. "Quite remarkably, the Melbourne man didn't realize he'd bought two entries, he thought he'd bought an entry for a different lottery draw," said Bronwyn Spence. "But because he marks his entries, he marked them with the same numbers that came out of the barrel tonight which meant he won division one twice." 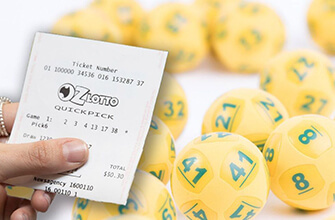 In the meantime, Oz Lotto is urging other players to check their numbers, as another player - who has not yet come forward and who cannot be contacted - won more than $23 million in the same draw. The winner bought the ticket at Hobart City Lotto at Argyle Street but the ticket wasn't registered and Oz Lotto is hoping that he or she will come forward in due time.